From Durness, we headed east along the North Coast 500 to the village of Tongue. Like every day we’ve ridden in Scotland, we rode mainly in a light drizzle. It’s impressive how consistently it can lightly drizzle here. 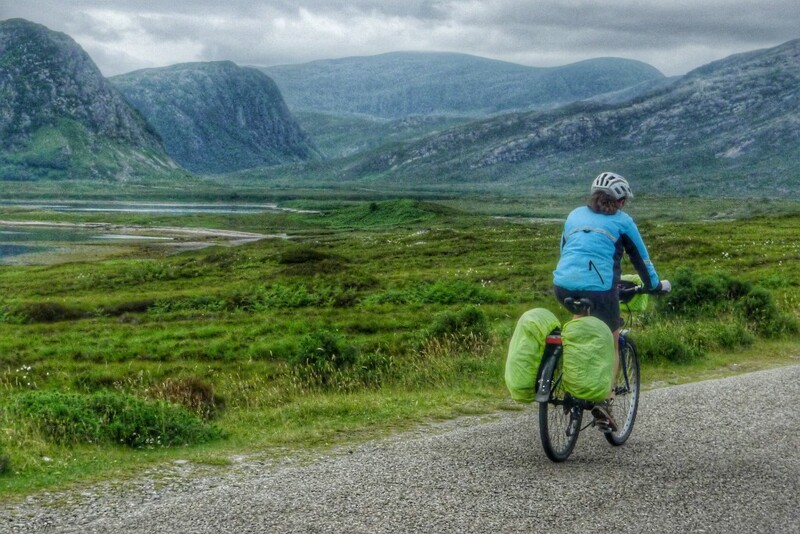 We rode around Loch Eriboll on our way to Tongue. We use a simple system for grading how bad the weather is in Scotland. We’ve started calling it the Scotland Weather Index. The index is based on what rain gear we need to wear to stay comfortable while riding. If we just need to wear our rain jackets, this is considered cloudy. In most countries cloudy means dry with potential rain. In Scotland cloudy means light rain with potential dry spells. All clouds are able to produce moisture. Even the innocent, light gray puffy clouds will get you wet here. As far as we know, Scotland doesn’t get better or worse than cloudy. It’s always cloudy. Sometimes it’s cloudy and windy. And there you have it. The Scotland Weather Index. Death, taxes, and cloudy.